Systemic lupus erythematosus (SLE) is an autoimmune disease affecting mainly women and characterized by alternating periods of disease activity (flares) and remission. Incidence in the US is approximately 5.5 to 7 per 100,000 person-years and prevalence is 73 to 92 per 100,000 person-years [1Lim SS, Bayakly AR, Helmick CG, Gordon C, Easley KA, Drenkard C. The incidence and prevalence of systemic lupus erythematosus, 2002-2004. Arthritis Rheum 2014; 66: 357-68. [http://dx.doi.org/10.1002/art.38239] [PMID: 24504808] , 2Somers EC, Marder W, Cagnoli P, et al. Population-based incidence and prevalence of systemic lupus erythematosus: the Michigan Lupus Epidemiology and Surveillance program. Arthritis Rheum 2014; 66(2): 369-78. [http://dx.doi.org/10.1002/art.38238] [PMID: 24504809] ]. SLE manifests at an earlier age and is more frequent and aggressive in African-Americans and Hispanics than in Caucasians [2Somers EC, Marder W, Cagnoli P, et al. Population-based incidence and prevalence of systemic lupus erythematosus: the Michigan Lupus Epidemiology and Surveillance program. Arthritis Rheum 2014; 66(2): 369-78. [http://dx.doi.org/10.1002/art.38238] [PMID: 24504809] -4Urowitz MB, Gladman DD, Ibañez D, et al. Evolution of disease burden over five years in a multicenter inception systemic lupus erythematosus cohort. Arthritis Care Res (Hoboken) 2012; 64(1): 132-7. [http://dx.doi.org/10.1002/acr.20648] [PMID: 21954226] ]. Symptoms of lupus, especially in the initial stages of the disease, are often non-specific and may occur also in patients with other connective tissue diseases (CTDs) [5Doria A, Mosca M, Gambari PF, Bombardieri S. Defining unclassifiable connective tissue diseases: incomplete, undifferentiated, or both? J Rheumatol 2005; 32(2): 213-5. [PMID: 15693073] ], making differential diagnosis challenging [6Mosca M, Tani C, Vagnani S, Carli L, Bombardieri S. The diagnosis and classification of undifferentiated connective tissue diseases. J Autoimmun 2014; 48-49: 50-2. SLE classification criteria have been developed by the American College of Rheumatology (ACR) and the Systemic Lupus International Classification Clinics (SLICC) [7Tan EM, Cohen AS, Fries JF, et al. The 1982 revised criteria for the classification of systemic lupus erythematosus. Arthritis Rheum 1982; 25(11): 1271-7. [http://dx.doi.org/10.1002/art.1780251101] [PMID: 7138600] -9Petri M, Orbai AM, Alarcón GS, et al. Derivation and validation of the Systemic Lupus International Collaborating Clinics classification criteria for systemic lupus erythematosus. Arthritis Rheum 2012; 64(8): 2677-86. [http://dx.doi.org/10.1002/art.34473] [PMID: 22553077] ] and include clinical and immunological features of SLE. Although non-specific symptoms of SLE, such as fatigue, fever, weight loss, arthralgia, and myalgia [10Bertsias GK, Pamfil C, Fanouriakis A, Boumpas DT. Diagnostic criteria for systemic lupus erythematosus: has the time come? Nat Rev Rheumatol 2013; 9(11): 687-94. [http://dx.doi.org/10.1038/nrrheum.2013.103] [PMID: 23838616] ] are excluded from classification criteria, many features of SLE may be subjective and difficult to assess. In addition, these instruments have not been validated for diagnostic purposes [11Manzi S, Navratil JS, Ruffing MJ, et al. Measurement of erythrocyte C4d and complement receptor 1 in systemic lupus erythematosus. Arthritis Rheum 2004; 50(11): 3596-604. [http://dx.doi.org/10.1002/art.20561] [PMID: 15529364] , 12Liu CC, Manzi S, Danchenko N, Ahearn JM. New advances in measurement of complement activation: lessons of systemic lupus erythematosus. Curr Rheumatol Rep 2004; 6(5): 375-81. In clinical practice, the diagnosis of SLE remains particularly challenging because the disease is heterogeneous, and because symptoms are often subjective and mimic those of other diseases [10Bertsias GK, Pamfil C, Fanouriakis A, Boumpas DT. Diagnostic criteria for systemic lupus erythematosus: has the time come? Nat Rev Rheumatol 2013; 9(11): 687-94. [http://dx.doi.org/10.1038/nrrheum.2013.103] [PMID: 23838616] , 11Manzi S, Navratil JS, Ruffing MJ, et al. Measurement of erythrocyte C4d and complement receptor 1 in systemic lupus erythematosus. Arthritis Rheum 2004; 50(11): 3596-604. [http://dx.doi.org/10.1002/art.20561] [PMID: 15529364] ]. The real-word “gold-standard” for diagnosis of SLE is the physician’s diagnosis [13Amezcua-Guerra LM, Higuera-Ortiz V, Arteaga-García U, Gallegos-Nava S, Hübbe-Tena C. Performance of the 2012 Systemic Lupus International Collaborating Clinics and the 1997 American College of Rheumatology classification criteria for systemic lupus erythematosus in a real-life scenario. Arthritis Care Res (Hoboken) 2015; 67(3): 437-41. [http://dx.doi.org/10.1002/acr.22422] [PMID: 25073545] , 14Pons-Estel GJ, Wojdyla D, McGwin G Jr, et al. The American College of Rheumatology and the Systemic Lupus International Collaborating Clinics classification criteria for systemic lupus erythematosus in two multiethnic cohorts: a commentary. Lupus 2014; 23(1): 3-9. [http://dx.doi.org/10.1177/0961203313512883] [PMID: 24285098] ], which could take time and may be unreliable. SLE is a frequent diagnosis (20-60%) in patients who evolve over time from undifferentiated CTD to a specific CTD [6Mosca M, Tani C, Vagnani S, Carli L, Bombardieri S. The diagnosis and classification of undifferentiated connective tissue diseases. J Autoimmun 2014; 48-49: 50-2. [http://dx.doi.org/10.1016/j.jaut.2014.01.019] [PMID: 24518855] ], however it may take several years for a definitive diagnosis to be made [15Bodolay E, Csiki Z, Szekanecz Z, et al. Five-year follow-up of 665 Hungarian patients with undifferentiated connective tissue disease (UCTD). Clin Exp Rheumatol 2003; 21(3): 313-20. [PMID: 12846049] , 16Guerrero LF, Rueda JC, Arciniegas R, Rueda JM. Undifferentiated connective tissue disease in a rheumatology center in Cali, Colombia: clinical features of 94 patients followed for a year. Rheumatol Int 2013; 33(4): 1085-8. [http://dx.doi.org/10.1007/s00296-011-2234-y] [PMID: 22116525] ]. On the other hand, early diagnosis and targeted and timely therapy may prevent flares and late organ damage [17Doria A, Gatto M, Zen M, Iaccarino L, Punzi L. Optimizing outcome in SLE: treating-to-target and definition of treatment goals. Autoimmun Rev 2014; 13(7): 770-7. [http://dx.doi.org/10.1016/j.autrev.2014.01.055] [PMID: 24480071] ], improve quality of life [18Urowitz M, Gladman DD, Ibañez D, et al. Changes in quality of life in the first 5 years of disease in a multicenter cohort of patients with systemic lupus erythematosus. Arthritis Care Res (Hoboken) 2014; 66(9): 1374-9. [http://dx.doi.org/10.1002/acr.22299] [PMID: 24497416] ], and decrease healthcare utilization and costs [19Oglesby A, Korves C, Laliberté F, et al. Impact of early versus late systemic lupus erythematosus diagnosis on clinical and economic outcomes. Appl Health Econ Health Policy 2014; 12(2): 179-90. [http://dx.doi.org/10.1007/s40258-014-0085-x] [PMID: 24573911] -21Narayanan S, Wilson K, Ogelsby A, Juneau P, Durden E. Economic burden of systemic lupus erythematosus flares and comorbidities in a commercially insured population in the United States. J Occup Environ Med 2013; 55(11): 1262-70. In addition to the diagnostic challenges outlined above, there are limitations with standard-of-care diagnostic immunology tests [10Bertsias GK, Pamfil C, Fanouriakis A, Boumpas DT. Diagnostic criteria for systemic lupus erythematosus: has the time come? Nat Rev Rheumatol 2013; 9(11): 687-94. [http://dx.doi.org/10.1038/nrrheum.2013.103] [PMID: 23838616] ]; anti-nuclear antibodies (ANA) have high diagnostic sensitivity but high false positivity rate among healthy individuals [22Satoh M, Chan EK, Ho LA, et al. Prevalence and sociodemographic correlates of antinuclear antibodies in the United States. Arthritis Rheum 2012; 64(7): 2319-27. [http://dx.doi.org/10.1002/art.34380] [PMID: 22237992] , 23Meroni PL, Schur PH. ANA screening: an old test with new recommendations. Ann Rheum Dis 2010; 69(8): 1420-2. [http://dx.doi.org/10.1136/ard.2009.127100] [PMID: 20511607] ], while antibodies to double-stranded DNA (anti-dsDNA) and/or to Smith antigen (anti-Smith) [24Suresh E. Systemic lupus erythematosus: diagnosis for the non-specialist. Br J Hosp Med (Lond) 2007; 68(10): 538-41. [http://dx.doi.org/10.12968/hmed.2007.68.10.27324] [PMID: 17974296] ] have low sensitivity and are negative in many SLE patients [25Hanly JG, Thompson K, McCurdy G, Fougere L, Theriault C, Wilton K. Measurement of autoantibodies using multiplex methodology in patients with systemic lupus erythematosus. J Immunol Methods 2010; 352(1-2): 147-52. [http://dx.doi.org/10.1016/j.jim.2009.10.003] [PMID: 19836394] , 26Liu CC, Manzi S, Kao AH, Navratil JS, Ahearn JM. Cell-bound complement biomarkers for systemic lupus erythematosus: from benchtop to bedside. Rheum Dis Clin North Am 2010; 36(1): 161-72. [http://dx.doi.org/10.1016/j.rdc.2009.12.003] [PMID: 20202597] ]. Although low levels of complement proteins C3 and C4 may be an indication of ongoing inflammation in SLE and have been incorporated in the SLICC classification criteria [9Petri M, Orbai AM, Alarcón GS, et al. Derivation and validation of the Systemic Lupus International Collaborating Clinics classification criteria for systemic lupus erythematosus. Arthritis Rheum 2012; 64(8): 2677-86. [http://dx.doi.org/10.1002/art.34473] [PMID: 22553077] ], measurement of C3 and C4 per se has several drawbacks, including low sensitivity, high inter-subject variability, and increased synthesis during inflammation to compensate for increased consumption [26Liu CC, Manzi S, Kao AH, Navratil JS, Ahearn JM. Cell-bound complement biomarkers for systemic lupus erythematosus: from benchtop to bedside. Rheum Dis Clin North Am 2010; 36(1): 161-72. [http://dx.doi.org/10.1016/j.rdc.2009.12.003] [PMID: 20202597] , 27Kao AH, Navratil JS, Ruffing MJ, et al. Erythrocyte C3d and C4d for monitoring disease activity in systemic lupus erythematosus. Arthritis Rheum 2010; 62(3): 837-44. [http://dx.doi.org/10.1002/art.27267] [PMID: 20187154] ]. Complement activation results in the formation of complement activation products that bind covalently to blood cells [11Manzi S, Navratil JS, Ruffing MJ, et al. Measurement of erythrocyte C4d and complement receptor 1 in systemic lupus erythematosus. Arthritis Rheum 2004; 50(11): 3596-604. [http://dx.doi.org/10.1002/art.20561] [PMID: 15529364] , 28Kalunian KC, Chatham WW, Massarotti EM, et al. Measurement of cell-bound complement activation products enhances diagnostic performance in systemic lupus erythematosus. Arthritis Rheum 2012; 64(12): 4040-7. [http://dx.doi.org/10.1002/art.34669] [PMID: 22932861] , 29Yang DH, Chang DM, Lai JH, Lin FH, Chen CH. Usefulness of erythrocyte-bound C4d as a biomarker to predict disease activity in patients with systemic lupus erythematosus. Rheumatology (Oxford) 2009; 48(9): 1083-7. 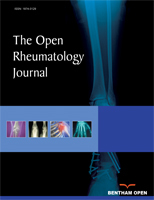 [http://dx.doi.org/10.1093/rheumatology/kep161] [PMID: 19553377] ]. The performance characteristics of these cell-bound complement activation products (CB-CAPs) have recently been validated in a prospective multicenter clinical study [30Putterman C, Furie R, Ramsey-Goldman R, et al. Cell-bound complement activation products in systemic lupus erythematosus: comparison with anti-double-stranded DNA and standard complement measurements. Lupus Sci Med 2014; 1(1): e000056. [http://dx.doi.org/10.1136/lupus-2014-000056] [PMID: 25396070] ] that showed that elevated B lymphocyte complement 4 derived ligand (BC4d) or erythrocyte complement 4 derived ligand (EC4d) have 22% higher sensitivity than low complement for the diagnosis of SLE. The Avise Lupus test incorporates the levels of autoantibodies and of Exagen’s proprietary biomarkers, EC4d and BC4d, into a 2-tiered method (Fig. 1 ) [30Putterman C, Furie R, Ramsey-Goldman R, et al. Cell-bound complement activation products in systemic lupus erythematosus: comparison with anti-double-stranded DNA and standard complement measurements. Lupus Sci Med 2014; 1(1): e000056. [http://dx.doi.org/10.1136/lupus-2014-000056] [PMID: 25396070] ]. Patients are considered tier 1 positive if titer of specific autoantibodies is above cut-off (anti-dsDNA > 301 units and positivity is confirmed by the Crithidia luciliae immunofluorescence test, or anti-Smith > 10 units), or if CB-CAPs are strongly positive (EC4d > 75 units or BC4d > 200 units). If tier 1 is negative, an algorithm that takes into account the levels of ANA, EC4d, BC4d, and the specificity component is calculated [30Putterman C, Furie R, Ramsey-Goldman R, et al. Cell-bound complement activation products in systemic lupus erythematosus: comparison with anti-double-stranded DNA and standard complement measurements. Lupus Sci Med 2014; 1(1): e000056. [http://dx.doi.org/10.1136/lupus-2014-000056] [PMID: 25396070] ]. The specificity component is represented by autoantibodies associated with diseases other than SLE, i.e., antibodies to MCV, SS-B/La, CENP, Jo-1, and Scl-70. The specificity component is assigned a value of 0 in the algorithm if all these antibodies are negative (≤ 10 units) and a value of 1 if any of these antibodies is positive (> 10 units). The 2-tiered method has high sensitivity and specificity in differentiating patients diagnosed with SLE based on the ACR classification criteria, including childhood onset SLE [31Askanase A, Hui-Yuen J, Conklin J, et al. Cell-Bound Complement Activation Products have high sensitivity and specificity in childhood-onset systemic lupus erythematosus and juvenile idiopathic arthritis [abstract]. Arthritis Rheumatol 2015; 67(Suppl 10). ], from patients diagnosed with other CTDs [30Putterman C, Furie R, Ramsey-Goldman R, et al. Cell-bound complement activation products in systemic lupus erythematosus: comparison with anti-double-stranded DNA and standard complement measurements. Lupus Sci Med 2014; 1(1): e000056. [http://dx.doi.org/10.1136/lupus-2014-000056] [PMID: 25396070] ] or fibromyalgia [32Wallace DJ, Silverman SL, Conklin J, Barken D, Dervieux T. Systemic lupus erythematosus and primary fibromyalgia can be distinguished by testing for cell-bound complement activation products. Lupus Sci Med 2016; 3(1): e000127. Patients were selected by Exagen on the basis of the results of the Avise Lupus test conducted as described [30Putterman C, Furie R, Ramsey-Goldman R, et al. Cell-bound complement activation products in systemic lupus erythematosus: comparison with anti-double-stranded DNA and standard complement measurements. Lupus Sci Med 2014; 1(1): e000056. [http://dx.doi.org/10.1136/lupus-2014-000056] [PMID: 25396070] ] between February and December 2014. As SLE affects mainly females, females 18 years and older at the time the test was performed were included; males were not included in this study to avoid a possible gender imbalance between cases and controls. Patient selection was carried out with the intent of identifying patients for whom a differential diagnosis, based on their immunological profile, may be challenging. In fact, all patients selected for the study were ANA positive by enzyme-linked immunosorbent assay, but negative for biomarkers specific for SLE: all patients had anti-dsDNA ≤ 301 units and anti-Smith ≤ 10 units. In addition, all patients were negative for the specificity component of the test (anti-MCV, anti-SS-B/La, anti-CENP, anti-Jo-1, anti-Scl-70 all negative: ≤ 10 units). Cases are defined as having a positive result for the Avise Lupus test (tier 1 positive or tier 2 index between 0.5 and 5), while controls had a negative test result (tier 1 negative and tier 2 index between -0.5 and -5) [30Putterman C, Furie R, Ramsey-Goldman R, et al. Cell-bound complement activation products in systemic lupus erythematosus: comparison with anti-double-stranded DNA and standard complement measurements. Lupus Sci Med 2014; 1(1): e000056. [http://dx.doi.org/10.1136/lupus-2014-000056] [PMID: 25396070] ]. Patients with an index score between -0.5 and 0.5 were not selected for the study as this interval is borderline negative or positive, and provides lower confidence in the clinical interpretation of the test result. The 2-tiered model of the Avise Lupus test. Investigators recorded features of SLE according to the ACR [8Hochberg MC. Updating the American College of Rheumatology revised criteria for the classification of systemic lupus erythematosus. Arthritis Rheum 1997; 40(9): 1725. [http://dx.doi.org/10.1002/art.1780400928] [PMID: 9324032] ] or SLICC criteria [9Petri M, Orbai AM, Alarcón GS, et al. Derivation and validation of the Systemic Lupus International Collaborating Clinics classification criteria for systemic lupus erythematosus. Arthritis Rheum 2012; 64(8): 2677-86. [http://dx.doi.org/10.1002/art.34473] [PMID: 22553077] ] at T0 and at T1. They also indicated at both time points what diagnosis they made, based on their clinical expertise, and medications; in addition, they indicated at T1 whether the patient experienced flares between T0 and T1. Characteristics of the patients included in the study. As indicated under Methods, all cases were Avise Lupus test positive; of these, 4 were tier 1 positive [30Putterman C, Furie R, Ramsey-Goldman R, et al. Cell-bound complement activation products in systemic lupus erythematosus: comparison with anti-double-stranded DNA and standard complement measurements. Lupus Sci Med 2014; 1(1): e000056. [http://dx.doi.org/10.1136/lupus-2014-000056] [PMID: 25396070] ] because either EC4d or BC4d were strongly positive. Twenty of the 23 cases (87%) were diagnosed by the investigator with SLE at T0 (n=17) or between T0 and T1 (n=3). Of the 3 cases diagnosed with SLE after T0, 1 was tier 1 positive; of the 3 cases not diagnosed with SLE, 1 of them was tier 1 positive. One of the 3 cases not diagnosed with SLE presented with photosensitivity and ulcers; the other 2 did not present with clinical features of SLE. All cases with a diagnosis of SLE at T0 had the same diagnosis at T1. 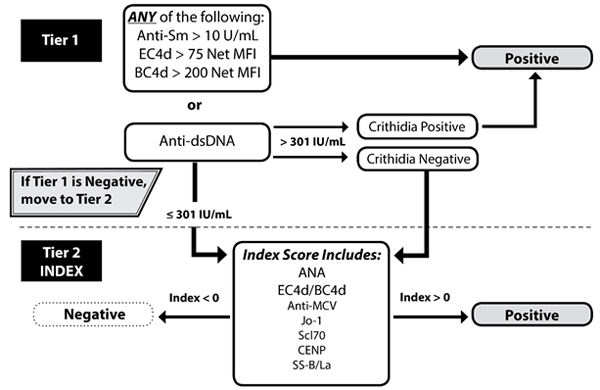 Sensitivity and specificity of the ACR score and of the Avise Lupus test. A higher percentage of patients who met the ACR criteria had EC4d above the cutoff value of 14 mean fluorescence intensity units, compared to patients who did not meet the ACR criteria (43% vs. 22%). A similar trend was observed for BC4d, although difference did not reach statistical significance. This data is in agreement with a previous study where diagnosis of SLE was based on fulfillment of the ACR criteria [30Putterman C, Furie R, Ramsey-Goldman R, et al. Cell-bound complement activation products in systemic lupus erythematosus: comparison with anti-double-stranded DNA and standard complement measurements. Lupus Sci Med 2014; 1(1): e000056. Use of medications (corticosteroids, methotrexate, and hydroxychloroquine) in cases and controls at T0. SLE-related flares were reported for 6 cases (6/23, 26%) between T0 and T1, and were of mild or moderate severity. Cases who experienced flares had higher EC4d than cases who did not (n=17) (p=0.0499) (Fig. 2 ). Although African-Americans and Hispanics were the minority of cases (9/23, 39%), they were the majority of cases who experienced flares (4/6, 67%). Diagnostic tests for SLE that measure autoantibodies (ANA, anti-dsDNA, and anti-Smith) and complement proteins have low sensitivity or specificity [22Satoh M, Chan EK, Ho LA, et al. Prevalence and sociodemographic correlates of antinuclear antibodies in the United States. Arthritis Rheum 2012; 64(7): 2319-27. [http://dx.doi.org/10.1002/art.34380] [PMID: 22237992] -25Hanly JG, Thompson K, McCurdy G, Fougere L, Theriault C, Wilton K. Measurement of autoantibodies using multiplex methodology in patients with systemic lupus erythematosus. J Immunol Methods 2010; 352(1-2): 147-52. [http://dx.doi.org/10.1016/j.jim.2009.10.003] [PMID: 19836394] ]. The Avise Lupus test was developed to address these limitations: by incorporating objective measurement of CB-CAPs and autoantibodies associated with CTDs, validation studies demonstrated that the test has high sensitivity and specificity [30Putterman C, Furie R, Ramsey-Goldman R, et al. Cell-bound complement activation products in systemic lupus erythematosus: comparison with anti-double-stranded DNA and standard complement measurements. Lupus Sci Med 2014; 1(1): e000056. [http://dx.doi.org/10.1136/lupus-2014-000056] [PMID: 25396070] -32Wallace DJ, Silverman SL, Conklin J, Barken D, Dervieux T. Systemic lupus erythematosus and primary fibromyalgia can be distinguished by testing for cell-bound complement activation products. Lupus Sci Med 2016; 3(1): e000127. We decided to investigate in this study whether the test aids the diagnosis of SLE in community rheumatology settings. To this end, we selected patients for whom a diagnosis of SLE would be particularly challenging based on standard-of-care tests that measure circulating autoantibodies. In fact, all patients selected for the study were positive for ANA - which has high sensitivity but low specificity [22Satoh M, Chan EK, Ho LA, et al. Prevalence and sociodemographic correlates of antinuclear antibodies in the United States. Arthritis Rheum 2012; 64(7): 2319-27. [http://dx.doi.org/10.1136/ard.2009.127100] [PMID: 20511607] ] - but negative for autoantibodies specific for SLE [24Suresh E. Systemic lupus erythematosus: diagnosis for the non-specialist. Br J Hosp Med (Lond) 2007; 68(10): 538-41. [http://dx.doi.org/10.12968/hmed.2007.68.10.27324] [PMID: 17974296] -26Liu CC, Manzi S, Kao AH, Navratil JS, Ahearn JM. Cell-bound complement biomarkers for systemic lupus erythematosus: from benchtop to bedside. Rheum Dis Clin North Am 2010; 36(1): 161-72. [http://dx.doi.org/10.1016/j.rdc.2009.12.003] [PMID: 20202597] ]. Cases were defined as patients with a positive Avise Lupus test result, while controls had a negative test result. To avoid selection bias, each case was matched with a control with the same ANA status (positive or strong positive), and chart reviews were done by the treating rheumatologist only if both patients in a pair could be included in the study. This assured that each investigator reviewed charts of matched cases and controls who had approximately 1 year of history. This interval of time was chosen to evaluate whether new features of SLE manifested, if features that were present at T0 resolved, or if diagnosis changed over time. It should be noted, however, that a period of time of 1 year may be insufficient to evaluate whether new features of SLE presented, as progression from undifferentiated CTD to SLE takes, on average, a longer period of time [15Bodolay E, Csiki Z, Szekanecz Z, et al. Five-year follow-up of 665 Hungarian patients with undifferentiated connective tissue disease (UCTD). Clin Exp Rheumatol 2003; 21(3): 313-20. [http://dx.doi.org/10.1007/s00296-011-2234-y] [PMID: 22116525] ]. In fact, minimal changes in clinical features occurred in our patient population between T0 and T1. Because of the rigorous selection criteria based on immunological characteristics, and because of the steps taken to avoid selection bias, only a small percentage of the entire pool of patients could be selected for this study. In addition, approximately 40% of the selected pairs could not be included in the study, mainly because 1 of the 2 patients did not have sufficient follow up. This suggests that the remaining patients might have been more involved in their healthcare, or were otherwise more motivated to continue to see their rheumatologist. It is unlikely that the patients included in the study were sicker, because the average physician’s global assessment was medium/low (1.36±0.77 on a scale 0-3) for the 18 patients (15 cases and 3 controls) for whom the value was provided at T0 (data not shown). Although the observation that our patient population had features of SLE commonly observed in patients with early or established disease [1Lim SS, Bayakly AR, Helmick CG, Gordon C, Easley KA, Drenkard C. The incidence and prevalence of systemic lupus erythematosus, 2002-2004. Arthritis Rheum 2014; 66: 357-68. [http://dx.doi.org/10.1002/art.38239] [PMID: 24504808] , 3Alarcón GS, McGwin G Jr, Roseman JM, et al. Systemic lupus erythematosus in three ethnic groups. XIX. Natural history of the accrual of the American College of Rheumatology criteria prior to the occurrence of criteria diagnosis. Arthritis Rheum 2004; 51(4): 609-15. [http://dx.doi.org/10.1002/art.20548] [PMID: 15334435] , 15Bodolay E, Csiki Z, Szekanecz Z, et al. Five-year follow-up of 665 Hungarian patients with undifferentiated connective tissue disease (UCTD). Clin Exp Rheumatol 2003; 21(3): 313-20. [PMID: 12846049] ] indicates that the patients in our study are a good representation of SLE patients encountered in clinical practice, it is unclear whether the results of this study can be extrapolated to the general population of patients in community rheumatology clinics. EC4d values in patients with flares. EC4d values (in mean fluorescence intensity units, MFI) and median (horizontal bars) in cases who experienced SLE-related flares (n=6) vs. cases who did not (n=17). *: p = 0.0499. EC4d: erythrocyte complement 4 derived ligand. A higher percentage of cases than controls was treated with corticosteroids or anti-rheumatic medications (methotrexate and hydroxychloroquine), consistent with the hypothesis that a diagnosis of SLE led to a more aggressive and targeted treatment, possibly improving patient outcome over time [17Doria A, Gatto M, Zen M, Iaccarino L, Punzi L. Optimizing outcome in SLE: treating-to-target and definition of treatment goals. Autoimmun Rev 2014; 13(7): 770-7. [http://dx.doi.org/10.1016/j.autrev.2014.01.055] [PMID: 24480071] -19Oglesby A, Korves C, Laliberté F, et al. Impact of early versus late systemic lupus erythematosus diagnosis on clinical and economic outcomes. Appl Health Econ Health Policy 2014; 12(2): 179-90. A higher percentage of cases met the ACR classification criteria than controls and the average ACR score was higher in cases than controls demonstrating, as expected, that the Avise Lupus test parallels the ACR score. Interestingly, all cases who met the ACR classification criteria of SLE (10/23, 43%) were diagnosed with SLE. On the contrary, only 4 controls (17%) met the same classification criteria, and none of them was diagnosed with SLE. The ACR classification criteria had low sensitivity in our study, strongly suggesting that classification criteria are not widely used in clinical practice to make a diagnosis of SLE in early lupus [12Liu CC, Manzi S, Danchenko N, Ahearn JM. New advances in measurement of complement activation: lessons of systemic lupus erythematosus. Curr Rheumatol Rep 2004; 6(5): 375-81. [http://dx.doi.org/10.1007/s11926-004-0012-5] [PMID: 15355750] ]. In addition, it is well accepted that some features of SLE are often subjective or overlapping, and that more objective tools are required to make an accurate and timely diagnosis. Our study suggests that the Avise Lupus test could represent such tool as it has higher sensitivity and specificity than the ACR score; the difference in sensitivity (83.3% vs. 41.7%) was highly significant (p=0.006). The ACR score has been reported to have higher sensitivity than what we observed [9Petri M, Orbai AM, Alarcón GS, et al. Derivation and validation of the Systemic Lupus International Collaborating Clinics classification criteria for systemic lupus erythematosus. Arthritis Rheum 2012; 64(8): 2677-86. [http://dx.doi.org/10.1002/art.34473] [PMID: 22553077] ]; different patient populations and investigators, and different use of the classification criteria may explain this difference. Although the SLICC criteria could represent an advantage for the diagnosis of SLE [13Amezcua-Guerra LM, Higuera-Ortiz V, Arteaga-García U, Gallegos-Nava S, Hübbe-Tena C. Performance of the 2012 Systemic Lupus International Collaborating Clinics and the 1997 American College of Rheumatology classification criteria for systemic lupus erythematosus in a real-life scenario. Arthritis Care Res (Hoboken) 2015; 67(3): 437-41. [http://dx.doi.org/10.1177/0961203313512883] [PMID: 24285098] ], SLICC criteria are not diagnostic criteria, either. In addition, we could not calculate a SLICC score for many patients because of missing data, as some features necessary for the calculation of the SLICC score were not evaluated by the rheumatologists. Taken together, these findings confirm the limited utility of classification criteria in clinical practice. Although it is unclear, from our study, what led to a diagnosis of SLE in the absence of fulfillment of classification criteria, it is well accepted that rheumatologists take into account symptoms that are somewhat non-specific, e.g. fatigue, fever, weight loss, arthralgia and myalgia, or Raynaud’s phenomenon [10Bertsias GK, Pamfil C, Fanouriakis A, Boumpas DT. Diagnostic criteria for systemic lupus erythematosus: has the time come? Nat Rev Rheumatol 2013; 9(11): 687-94. [http://dx.doi.org/10.1038/nrrheum.2013.103] [PMID: 23838616] ]: it is possible that some of these symptoms were present in our patient population and were taken into account for the physician diagnosis, although were not recorded for the purpose of this study. We observed that a higher percentage of patients who met the ACR criteria had elevated CB-CAPs compared to the percentage of patients who did not. This finding indicates that previous data [30Putterman C, Furie R, Ramsey-Goldman R, et al. Cell-bound complement activation products in systemic lupus erythematosus: comparison with anti-double-stranded DNA and standard complement measurements. Lupus Sci Med 2014; 1(1): e000056. [http://dx.doi.org/10.1136/lupus-2014-000056] [PMID: 25396070] , 32Wallace DJ, Silverman SL, Conklin J, Barken D, Dervieux T. Systemic lupus erythematosus and primary fibromyalgia can be distinguished by testing for cell-bound complement activation products. Lupus Sci Med 2016; 3(1): e000127. [http://dx.doi.org/10.1136/lupus-2015-000127] [PMID: 26870391] ] that showed elevated CB-CAPs in patients who fulfilled the ACR criteria for SLE hold true in community rheumatology settings where diagnosis is not necessarily based on classification criteria. Interestingly, 6 cases, all diagnosed with SLE at T0, experienced a mild to moderate flare based on the investigators’ assessment. Cases with a flare had higher EC4d at T0 than cases who did not have a flare. Several studies have attempted to identify predictors of flares in patients with SLE [26Liu CC, Manzi S, Kao AH, Navratil JS, Ahearn JM. Cell-bound complement biomarkers for systemic lupus erythematosus: from benchtop to bedside. Rheum Dis Clin North Am 2010; 36(1): 161-72. [http://dx.doi.org/10.1016/j.rdc.2009.12.003] [PMID: 20202597] , 33Petri MA, van Vollenhoven RF, Buyon J, et al. Baseline predictors of systemic lupus erythematosus flares: data from the combined placebo groups in the phase III belimumab trials. Arthritis Rheum 2013; 65(8): 2143-53. 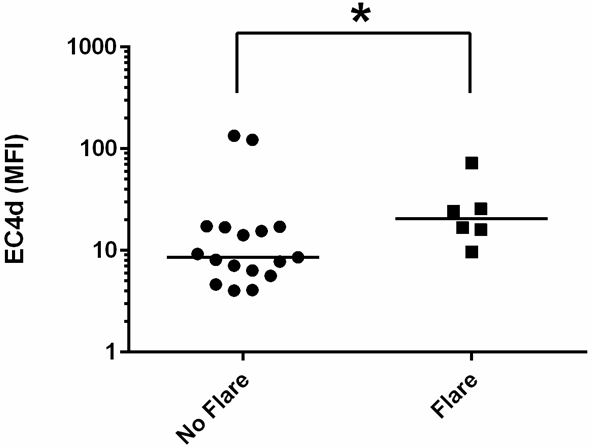 [http://dx.doi.org/10.1002/art.37995] [PMID: 23754628] , 34Floris A, Piga M, Cauli A, Mathieu A. Predictors of flares in Systemic Lupus Erythematosus: Preventive therapeutic intervention based on serial anti-dsDNA antibodies assessment. Analysis of a monocentric cohort and literature review. Autoimmun Rev 2016; 15(7): 656-63. [http://dx.doi.org/10.1016/j.autrev.2016.02.019] [PMID: 26921641] ]. A recent study found that low baseline C3 levels predict severe flares in a large patient population [33Petri MA, van Vollenhoven RF, Buyon J, et al. Baseline predictors of systemic lupus erythematosus flares: data from the combined placebo groups in the phase III belimumab trials. Arthritis Rheum 2013; 65(8): 2143-53. [http://dx.doi.org/10.1002/art.37995] [PMID: 23754628] ], and another demonstrated that EC3d and EC4d parallel SLE disease activity [27Kao AH, Navratil JS, Ruffing MJ, et al. Erythrocyte C3d and C4d for monitoring disease activity in systemic lupus erythematosus. Arthritis Rheum 2010; 62(3): 837-44. [http://dx.doi.org/10.1002/art.27267] [PMID: 20187154] ], supporting our findings. Although African-Americans were a minority in the overall case population, they were the majority of cases with flares, consistent with the fact that SLE is more aggressive in African-Americans than whites [1Lim SS, Bayakly AR, Helmick CG, Gordon C, Easley KA, Drenkard C. The incidence and prevalence of systemic lupus erythematosus, 2002-2004. Arthritis Rheum 2014; 66: 357-68. [http://dx.doi.org/10.1002/art.38239] [PMID: 24504808] -4Urowitz MB, Gladman DD, Ibañez D, et al. Evolution of disease burden over five years in a multicenter inception systemic lupus erythematosus cohort. Arthritis Care Res (Hoboken) 2012; 64(1): 132-7.